While living on Neptune's moon Triton, you'd be subjected to the coldest temperatures in the solar system, incredibly weak gravity and retrograde sunrises and sunsets. 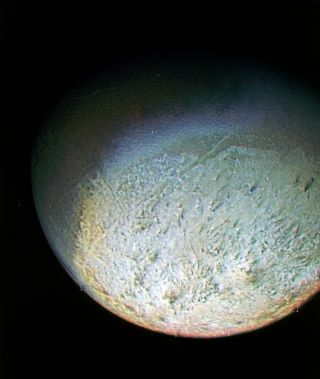 This image of Triton was taken by NASA's Voyager 2 spacecraft in 1989. Neptune, like the other gas giants in our solar system, doesn't have much of a solid surface to live on. But the planet's largest moon, Triton, could make an interesting place to set up a space colony. So far, only a single spacecraft has ever visited Triton. In the summer of 1989, Voyager 2 flew by Neptune and its system, and was able to photograph the southern hemisphere of the moon. The surface of Neptune's moon Triton is so cold, the ground is made of frozen nitrogen. See what it would be like for an astronaut living on Triton in this full infographic. "We poorly understand this plume activity," Adam Masters, a space physicist at Imperial College London in the U.K., told Space.com. "But I would err on the side of caution and not want to be standing on the region where the plume erupts." Though there are slight winds in Triton's thin atmosphere, you wouldn't feel any breeze while standing on the surface. "It would be very much like standing on our moon," Masters said, adding that Triton's weak atmosphere doesn't allow for weather or sky colors. As Neptune makes its 165-year-long trip around the sun, the polar regions of Triton take turns bathing in the sun for some 80 years at a time. The sunlight results in seasonal changes to Triton's surface pressure — the atmosphere thickens a bit after the sun causes frozen nitrogen, methane and carbon monoxide on Triton's surface to sublimate into gas. The atmospheric pressure in Triton's southern hemisphere is estimated to have quadrupled since Voyager 2 visited the moon, but it's still 20,000 times less than Earth's surface pressure. If you lived on Triton, you wouldn't get to enjoy any seasonal effects to temperature. With an average temperature of minus 391 degrees Fahrenheit (minus 235 Celsius), Triton is the coldest- known object in the solar system. Interestingly, Triton didn't form along with its parent planet, and was likely an object that Neptune captured. Because of this, Triton is the only moon in the solar system that orbits in a direction opposite to the rotation of its parent planet. If you lived in a region on the moon that gets both night and day (a day on Triton is almost six Earth days), you would see the sun — which would be just a dot in the sky — rise in the west and set in the east. What's more, Triton's orbit around its planet is inclined, so if you were on the side of the moon that always faces Neptune, you would get a view of not just Neptune's equatorial region, but also its northern polar and southern polar regions. "That's different from any other moon in the solar system," Masters said. And with Neptune appearing 10 times larger than our moon, you would be able to clearly see its features. It's not clear if Triton has any interesting geological features you'd want to visit, but if you did take a walk around the moon in a straight line, it would take 70 Earth days, Masters said. Though, that's assuming you could get used to walking in Triton's incredibly low gravity, which is about 8 percent of Earth's gravity, or half of the moon's gravity. But don't expect you could pass the time during your walk by talking on the phone with someone back on Earth — it takes light (and radio signals) four hours to travel from Triton to Earth. "That would be a really slow conversation," Masters said.